This was just out of the blue that I decided to go to this show. My friend Anders in Borås, Sweden said this was his current favourite band, and he has great taste, so I said I would check them out and record the show for him since he would not be able to make it. I took the train over to Malmö and went to the drummer Kaufman from Bland Bladens (http://artists.mp3s.com/artists/403/blandbladen.html) and the guitarist (Sabana) was there as well. We hung out for a bit and had a drink and then headed over to the venue. The band started right at 10:30 and the place was pretty packed. We were on the guest list as the room mate of Kaufmann drives tour buses and used to play in Mother Superior, a great Swedish band, and he had driven this band. 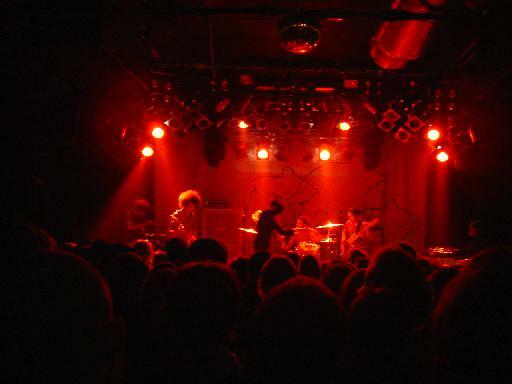 Anyway, this was some really intense stuff that The Mars Volta delivers. Think of a classic Led Zeppelin feel but with the controlled chaos of the best of Acid Mothers Temple and you have this band. A lot of jamming and improv mixed into their songs. Since I have not heard the CD, I can’t say how the live compares but this must be very different from the CD as some of the segments were up to 30 minutes and most of the show just ran together. Very intense and well played stuff. These guys can really play and the drummer is perhaps the leader with the way he seems to direct things. The singer is very good and psychedelic with cool vocal effects and wild singing. If you can see these guys live, do it, you will not regret it. Amazing stuff!!!!!!!!!!!!! I have no idea what the set list was and have not found it on the internet.